With Black Panther the eighteenth movie in their Cinematic Universe, Marvel have dominated the comic book genre for so long that you could be forgiven for feeling that superhero fatigue has well and truly set in. If audiences still have the appetite, do filmmakers still have the ideas? 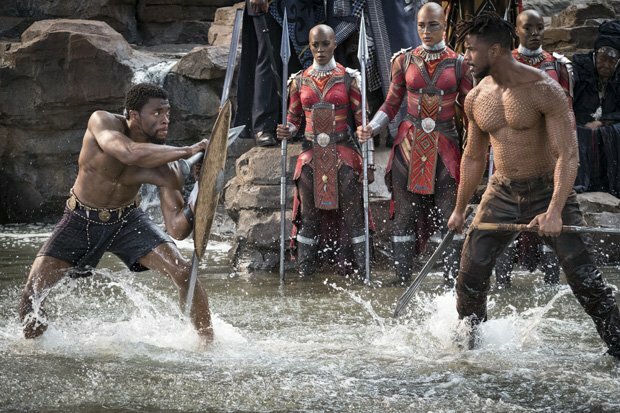 So it's hugely to the credit of co-writer/director Ryan Coogler (Fruitvale Station, Creed) and his team that this origin story set in the fictional African nation of Wakanda breaks new ground aplenty. Picking up from events in 2016's Captain America: Civil War, Chadwick Boseman gets to put some flesh on the character of Prince T'Challa that he briefly played there, watching as his father was killed by the Helmut Zemo orchestrated bomb at a United Nations conference. Returning to Wakanda a week later, the grieving Prince must ascend to the throne, becoming the so-called Black Panther as he ingests a herb to gain super combat powers. The nuts of the plot sees T'Challa and former lover Nakia (Lupita Nyong'o), among others, track down the South African mercenary Ulysses Klaue (Andy Serkis) – last seen in Avengers: Age of Ultron – after he steals an artefact made of the precious Wakandan metal vibranium. While Klaue is aided by Michael B Jordan's ex-black ops soldier – ominously nicknamed 'Killmonger' – T'Challa has his own support network, including an all-female posse of bodyguards, led by Danai Gurira's fierce Okoye. Playing the first superhero of African descent (who debuted in the Fantastic Four comics in 1966), Boseman is dignified, agile and thoroughly impressive in the role, although he almost gets upstaged by the female contingent, particularly Letitia Wright, who plays his super smart and mischievous younger sister Shuri, Wakanda's tech wizard – a sort of Q to T'Challa's James Bond. Coogler ensures that such humour sits comfortably alongside the sombre themes of legacy, social responsibility and leadership; the payoff to a car chase through the streets of Busan is uproariously funny. For all its awesome action and real-world concerns, Black Panther is also surprisingly wacky. It may not be as trippy as Doctor Strange or as offbeat as Ant-Man, but as it takes us on a journey through the strange and subversive, high-tech and tradition-rich world of Wakanda it's one hell of a magical mystery tour. General release from Tue 13 Feb.